Dancing Pros: Live brought some of the world’s finest ballroom dancers to north Georgia the week of Valentine’s Day. The performers, which included Karina Smirnoff, Edyta Sliwinska and Chelsie Hightower from Dancing with the Stars and Benji Schwimmer from So You Think You Can Dance, spiced up the stage with lots of hot group and partner routines. What makes Dancing Pros: Live so unique is its format. In this production, which is organized to be like a reality TV dance competition, the audience chooses the winners. Dancers battle it out in two rounds, showing two routines per couple, and at the end of each show, the winners are announced. Hosted by Golden Globe nominee and Growing Pains star Alan Thicke, Dancing Pros: Live is also peppered with group routines in various styles to popular songs. Vocalist Angel Taylor, a pop singer-songwriter who recently competed on NBC’s hit show The Voice, sang many songs live. There are even two dance judges who comment after each couple’s routine to advise the crowd what was successful and what wasn’t. It’s obvious this show is well thought out and meant to reflect the production values audiences love in SYTYCD and DWTS. In this specific performance, SYTYCD Season 2 Winner Benji Schwimmer won with his partner Torri Smith, a 10-time West Coast Swing World Champion. They performed two truly jaw-dropping routines, complete with lifts that left viewers gasping and in ravenous applause. In the video shown before their first freestyle routine – each couple had an introduction showing them preparing for the show in rehearsal, similar to SYTYCD and DWTS again – Benji said he has known Torri for over a decade and that they have a very strong bond. This was evident in their dancing, as they exhibited the sleekness only longtime couples are capable of achieving. One minor disappointment was Chelsie Hightower and Russian Latin finalist Dmitry Demidov’s performances. While the dancing was strong, it was obvious the two were missing that much-needed emotional connection for dances like the Vietnamese Waltz. The formality was there but the fire wasn’t. Overall, it’s safe to say that Dancing Pros: Live is a one-of-a-kind live experience. For one, how often do theater attendees use electronic remotes to share their opinions with performers? 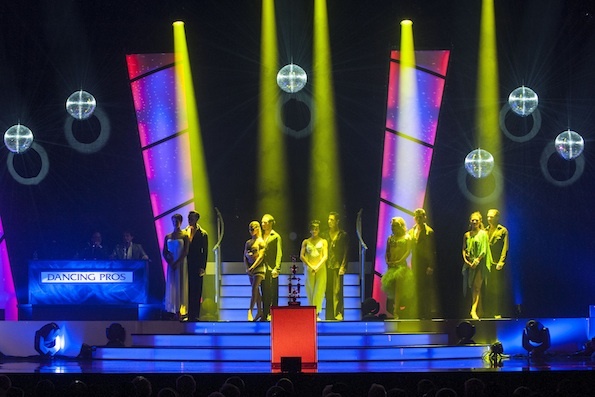 For those looking for a new, interactive dance show or a performance where they can appreciate ballroom dance styles from the Cha-Cha to the Jitterbug, this is it! The best part? You don’t have to fly to the U.K. for the legendary Blackpool Dance Festival to see some of the world’s top talent! The tour, which has been on the road since November, will continue through April 19, finishing in Charlotte, NC. 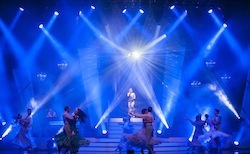 For more information on Dancing Pros: Live, check out www.dancingproslive.com. Photos courtesy of Dancing Pros: Live.